Smallest of the nuthatches, about four inches long. Brown crown, blue-gray or gray-brown back and wings lined with black and sometimes white. White throat, cheeks, underparts, and small nape patch. Very short tail. Western equivalent of the Brown-headed Nuthatch. Inhabits mixed and coniferous forests from southern British Columbia, Idaho and western Montana to southern California, Arizona, New Mexico, Texas and Mexico. They build nests of feathers, leaves and other foliage in natural or abandoned cavities or in cavities which they excavate themselves. Sometimes the nest in correctly sized and mounted birdhouses in the right habitats. The Pygmy Nuthatch Birdhouse is the same as for brown-headed nuthatch and chestnut-backed and Siberian chickadees. It has a 4″ by 4″ floor and a 9″ inside floor to ceiling height. The entrance hole is 1 1/8″ diameter and is located 7″ above the floor. Ventilation openings are cut into the floor and under the roof. A hinged roof is secured with shutter hooks. Assemble with corrosion resistant screws in pre-drilled countersunk pilot holes. Mount this nest box in a coniferous tree between eye level and just out of reach. Place a few chips on the nest box floor. Remove the nest and clean the box well after the brood rearing season is past. Smallest of the nuthatches, about four inches long. Brown crown, blue-gray or gray-brown back and wings lined with black and sometimes white. White throat, cheeks, underparts, and small nape patch. Very short tail. Western equivalent of the Brown-headed Nuthatch. Builds nests of feathers, leaves and other foliage in natural or abandoned cavities or in cavities which they excavate themselves and sometimes in correctly sized and mounted birdhouses in optimum habitats. Small flocks of pygmy nuthatches dart throughout pine trees, on trunks, limbs and needles feeding on insects, spiders, their eggs and larva and pine cone seeds. Nuthatches feeding helps control tree parasites and the diseases spread by insects. 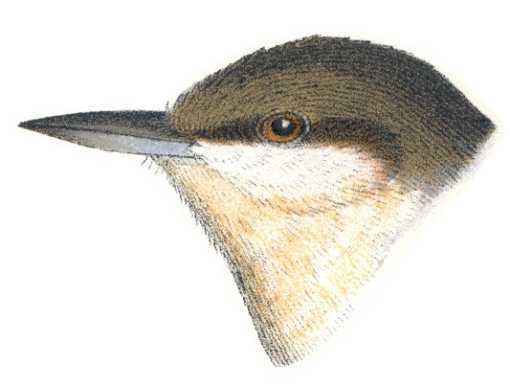 The Pygmy Nuthatch Birdhouse is the same as for brown-headed nuthatch, chestnut-backed and Siberian chickadees.